I have been painting like crazy these past few weeks. I had a goal of painting ten new paintings for my next solo show. I have completed seven in the last two weeks. Apparently, a deadline is an effective motivator for me! 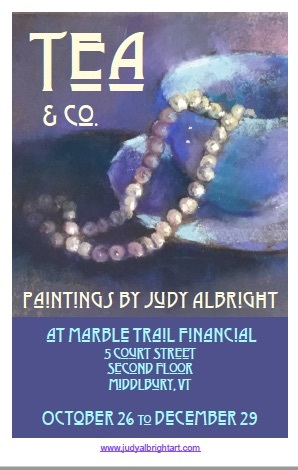 I invite you all to come to the opening celebration for Marble Trail Financial here in Middlebury. I was asked to be the first artist to grace the walls of their newly renovated space on the second floor of the old Court House building here in Middlebury. The Open House is from 5 - 7 on October 26th. I have a wonderful accountant who is a part of this group and I highly recommend their services. "Tea & Co." will feature paintings related to the joys of enjoying a cup of tea! The first step in creating a still life painting is the set up. This is one method I use to get dramatic lighting for my paintings.